Seven months into President Donald Trump’s administration, nearly half of all Democratic and Democratic-leaning registered voters describe their political views as liberal. The share of Democrats who describe themselves this way has steadily risen and is now 20 percentage points higher than in 2000. 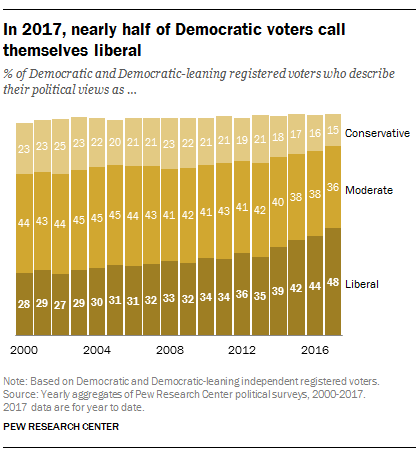 Through the first half of 2017, more Democratic voters identify as liberal (48%) than as moderate (36%) or conservative (15%), based on an average of Pew Research Center surveys. In 2008, 41% of Democratic voters called themselves moderate, while 33% said they were liberal and 23% said they were conservative. And in 2000, Democratic voters who called their views moderate outnumbered liberals by 44% to 28%, while 23% said they were conservative. White Democrats, in particular, increasingly characterize their political views as liberal, while blacks and Hispanics are far less likely to embrace that description. This year, 55% of white Democratic and Democratic-leaning registered voters identify themselves as liberal, while 35% describe themselves as moderate and 8% as conservative. The share of white Democrats who identify as liberal is up 27 percentage points since 2000, while the shares describing themselves as moderate or conservative are down 11 points and 13 points, respectively. By contrast, more black Democratic voters continue to characterize their views as moderate than as liberal. This year, 40% of black Democrats call themselves moderate, 30% say they are conservative and 28% call themselves liberal. Among Hispanic Democratic voters, 36% describe their political views as moderate, 41% as liberal and 22% as conservative. 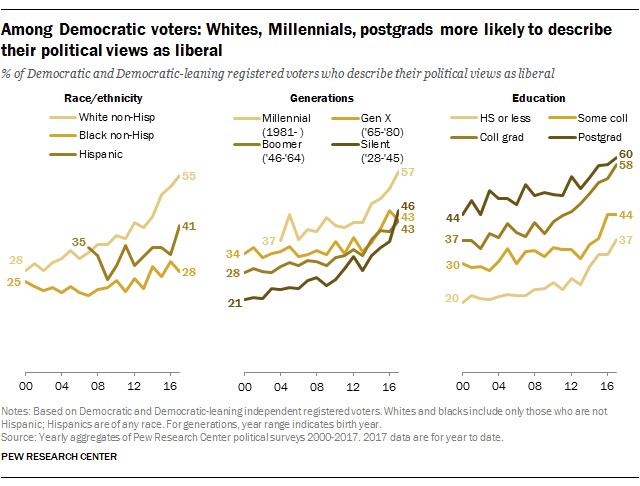 While the share of Democratic voters who see their views as liberal has increased across most age groups, Millennial Democratic voters continue to be more likely than Democrats in older generations to call their views liberal. In 2017, 57% of Millennial Democrats (those ages 18 to 36 in 2017) call themselves liberal, compared with 46% of Silent Democrats (72 to 89) and 43% each of Boomers (53 to 71) and Gen X (37 to 52). Democratic voters with higher levels of education are also more likely to call themselves liberal than are those with less education. Today, a majority of Democratic voters with postgraduate experience (60%) describe their political views as liberal, as do 58% of college graduates with no postgraduate experience. Fewer Democratic voters with some college experience but no degree (44%) and those with no college experience (37%) characterize their political views as liberal. How people describe their political views and what their actual political attitudes are are different things, though they are strongly related. While most Americans continue to express at least some mix of liberal and conservative attitudes, the share who hold either uniformly liberal or uniformly conservative values is growing. Note: This is an update of a previous post, published Feb. 9, 2016.